Welcome to another installment of a segment where we dive into one Elder Scrolls Online’s many Sets, and explore what sort of Builds you can make. Not only will we show you how to get the most from these Sets, but we’ll explain where to get them, what requirements there are to obtain them (if any), and everything else you could possibly want to know about them. In this article we take a look at Dead-Water’s Guile Set, which is used to gain Ultimate at a faster rate. This Set was added to the game with Update 20 Murkmire, which launched in October/November of 2018. Dead-Water’s Guile is an Overland Set that drops in the Murkmire Region (Murkmire DLC required). Overland Sets are found by defeating Bosses, clearing Dolmens and looting treasure chests in their respective zones, and are bind on equip. The Style of this set is Elder Argonian. Elder Argonian Motifs will become available by doing Daily Quests in Murkmire in the next major Update. Since this is an Overland Set, it will drop all weapon types, jewelry and armor pieces but only in Medium Armor. Traits on this set are random, but the Jewelry will always have the Robust Trait. Keep in mind that you can use Transmutation to change Traits if you wish, however the Summerset expansion is needed, along with 50 Transmute Crystals. Dead-Water’s Guile Set increases Weapon Damage, Max Health and Max Stamina, but the beauty in this Set is in its 5 piece set bonus. It restores 5 Ultimate 2 secs after any enemy you attacked dies. You don’t have to be the one to kill the enemy, just damage it 2 secs before it dies to reap the benefits of this set. This bonus has no cooldown , and that means it is great against large groups of enemies but completely useless against bosses unless they spawn many trash mobs. Ultimate Skills are very powerful abilities that do not use Magicka or Stamina. Instead activating Ultimate Skills costs a separate resource called Ultimate Points. Ultimate Points are generated by attacking enemies with light or heavy attacks. When an enemy is hit, you get a buff that lasts 8 secs and it gives 3 ultimate points per sec for a total of 24 Ultimate Points. Ultimate Points are not generated only with attacks, but also by Dodging and Blocking. How this Set works is that anytime you strike an enemy with an attack that deals damage 2 secs before it dies, you will receive 5 Ultimate points upon its death. You don’t need to be the one that kills an enemy, as long as you damaged it within 2 seconds of it dying. This Set doesn’t have a cooldown, which means that you can gain Ultimate very quickly by helping to kill many enemies in rapid succession. 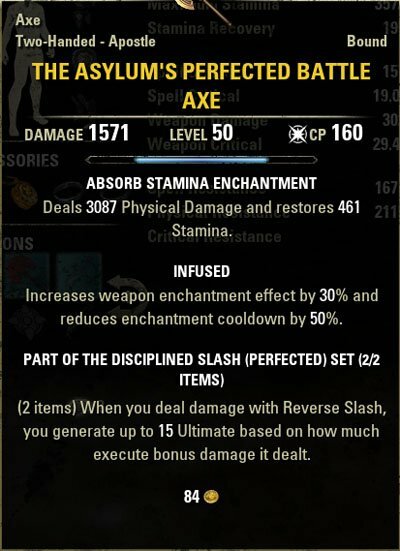 Using the Decisive Trait on your Weapon will add an additional Ultimate a certain percentage of the time, so it is certainly worth considering. 5 piece set bonus is not limited by range, meaning that ranged characters can benefit from it as well. The setup in this clip is not optimized, but you can gain tons of Ultimate with Shooting Star and this setup. The best way too pull this off is by doing 2 things: using AoEs and DoTs. AoEs will allow you to strike many enemies at a time, which helps to improve your odds of gaining Ultimate. And, DoTs will guarantee that you deal damage just before each enemy dies, as they usually tick for damage every 1-2 seconds. For this reason you’ll want to look for Skills that are both of these things like Caltrops, Volley, Cleave or even Dawnbreaker. By hitting many enemies with DoTs you will ensure that you gain Ultimate fast! As a Tank, usually your DPS is low, but Ultimates can change that by allowing you to use something like Dawnbreaker much more often. It would not be a bad idea to combine this Set with something like Champion of the Hist and Bloodspawn for maximum Ultimate gain (to further increase your Dawnbreaker usage). You can also use this Set for harder trash pulls, such as in Trials, where enemies die somewhat frequently in order to gain more War Horns or Shield Walls, if necessary. It’s not the best tanking Set out there by any means, but it is also not the worst, and is a solid choice for new Tanks. Likewise, this Set is not a bad idea for a Stamina DPS that wants to spam Dawnbreaker often, speeding up the trash pulls in Dungeons and Trials. Consider using this when you want to go for speed run achievements, just remember to swap it out for something else when you get to bosses that have no adds, or it may not be so useful. Dead-Water’s Guile can be also used on anyone that wants to farm large groups of enemies for materials or Champion Points. It does not matter what class you are, using this Set combined with anything relevant for your class will speed up the process if you have a cheap Ultimate Skill you can spam. Dead-Water’s Guile is going to be more effective when fighting in larger battles (more enemy players more Ultimate Points), but can still be effective in smaller scale PvP. Max Health, Max Stamina and Weapon Damage are all great bonuses for a PvP Stamina DPS, and most Stamina DPS get their kills from Dawnbreaker. However, I would not recommend using this Set unless you are playing with at least 2 other players in your group, and are actively seeking out scenarios where you are fighting as many or more players. More Ultimate = More Dawnbreakers = More Kills! 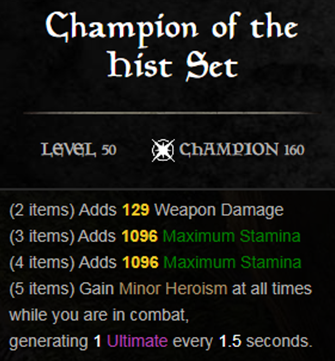 Champion of the Hist is definitely worth considering here as well, because the 2,3 and 4 piece bonuses are all also very good, meaning you won’t lose out on “that” much DPS. And what you do lose in overall DPS, you should gain in burst damage, which where you will succeed. 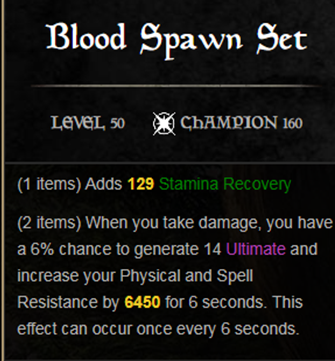 Blood Spawn is probably overkill for this type of setup, so I would suggest using something like Selene’s, Slimecraw or Velidreth for further increased bursts. Decisive Weapons are not recommended for PvP, as you will need the increased damage from Sharpened or Nirhoned to be competitive. 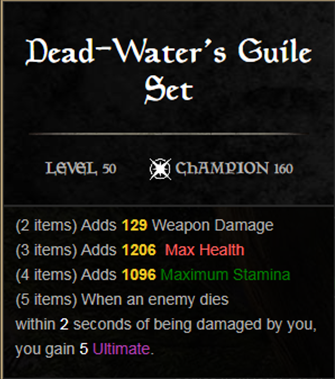 The Ultimate gained from using Dead-Water’s Guile works at ANY range, so it can be used effectively with Bow builds, or in scenarios where it isn’t possible to stay near your targets (like during sieges in Cyrodiil). Be sure to use AoEs and DoTs in order to make sure you gain that 5 Ultimate when the target(s) die! Since Dead-Water’s Guile is a Medium Armor Set, it would be wise for Tanks to equip pieces of this set in there Weapon and Jewelry slots in order to equip a Heavy Armor set on their body. Consider also getting getting a Bow or Greatsword for you back bar, so that you can put AoE DoTs with either Cleave or Acid Spray. The Asylum Greatsword also grants you Ultimate when striking enemies with Reverse Slash, which will further boost Ultimate gain whether or not you are Tanking or DPSing. Consider backbarring it on your tank, or using on your front bar if you are a DPS in order to gain a HUGE boost to Ultimate. The Reverse Slice morph hits 2 other enemies, so definitely use this one for best results. This Greatsword works extremely well with this setup. As mentioned above, this Set works fantastically against large groups of enemies. By using weapons with the Decisive Trait, Heroism buff and the Shooting Star Ultimate from the Mage’s Guild, you can fill up Ultimate very fast. The Shooting Star Ultimate ability generates Ultimate points for every enemy hit with the initial blast and this is AoE ability, meaning you are going to hit a lot of enemies at once. On top of all that Decisive Trait gives you chance to receive additional ultimate point every time ultimate points are gained, and they are going to be gained at a fast rate with Heroism and Shooting Star. You get a Meteor and you get a Meteor! Everybody gets a Meteor! 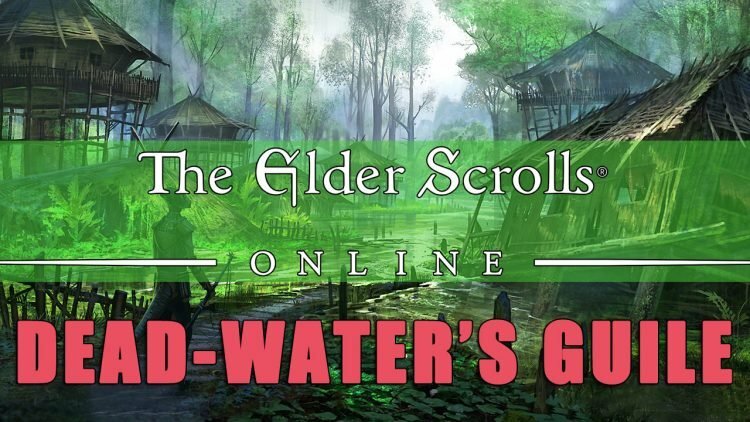 Stay tuned as I’ll be covering the rest of the Murkmire Sets, and be sure to check out our other ESO Guides!